SPIDERBEAM offers a complete line of portable and heavy duty wire multi-element yagis for temporary or permanent installation. Collapsible fiberglass poles in sizes of 40, 60, and 85 feet with guy brackets, clamp kits, wire vertical conversion kits. Collapsible aluminum masts in heights of 33, 41, 47, 49, 60 feet with guy hardware allowing mast rotation 360 degrees even when guyed, rotator adapters, and many more items. The Spiderbeam yagi antennas are available in two types, Portable and HEAVY DUTY. Portable version - 12 lbs. Heavy Duty version - 25 lbs. The portable and heavy duty versions are the same except the HD version uses double wall thickness fiberglass and more robust element-to-boom attachments and truss support for permanent installation. The portable version is designed for ease of use to install and take down and is meant to be used in non-extreme weather conditions for shorter periods (i.e. 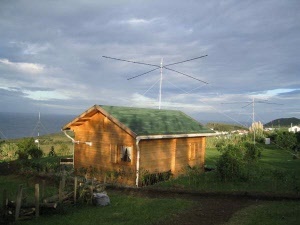 DXpeditions, contest operations, Field Day). The HD version is designed to be permanently installed, or used in more extreme portable weather conditions like high wind strength. Each version requires the same amount of time to construct and erect. Multiple band configurations from 10m-20m. 5 band version for 10/12/15/17/20m. In addition, we offer an assembly service for the yagi antenna kits at an additional cost. With assembly service, we pre-cut all the wires, assemble all the support ropes, build the balun - all the one-time physical construction tasks are done for you. All that is left to do is stack the fiberglass segments and attach support cables and the wire elements.